Thanks to a new app the Perot Museum of Nature and Science launched globally this week, armchair explorers can virtually discover ancient bones deep inside a South African cave. 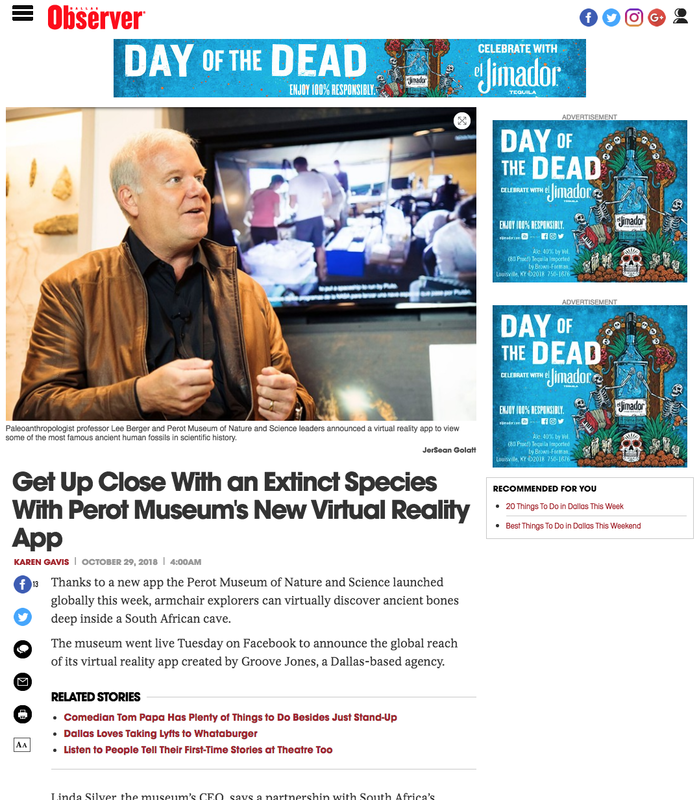 The museum went live Tuesday on Facebook to announce the global reach of its virtual reality app created by Groove Jones, a Dallas-based agency. Linda Silver, the museum’s CEO, says a partnership with South Africa’s University of Witwatersrand and professor Lee Berger, a paleoanthropologist and National Geographic explorer, helped make it all happen. “New scientific discoveries are taking place in South Africa regarding early human origins,” Silver says, adding that the free app, which is available in six languages, allows the world to get up close with Homo naledi, a previously unknown, extinct species that Berger discovered in 2015. After eliminating a variety of reasons why such a vast amount of bones would be found in the remote, inaccessible chamber, Berger says a hypothesis was formed that the species was “deliberately disposing of its dead” there. Berger says it’s unclear the relationship the “very strange, primitive member of our genus” had with living humans. Fragments found inside the harsh conditions of the cave indicate a bipedal hominid with ape-like shoulders and an orange-sized brain, Berger says. The fossils, which are estimated to be 250,000 years old, also have hands with what Berger described as curved, super human-like fingers and “remarkably human-like” feet. “It’s certainly in our family,” he says. “It walks on two legs, but you wouldn’t mistake it as human. Berger, who grew up in rural Georgia and is now a dual citizen of the United States and South Africa, says his “find of a lifetime” shows that there are things waiting to be discovered that we don’t know existed. He also said the evidence is critical because the species existed during the same time and in the same broad region “where we believe the first evidence of the complex of modern humans were arriving.” And it could have had some role to play in the origin of our species whether by genetics, behavioral influence or interaction. “It’s awesome to find these hominid fossils,” says Becca Peixotto, a member of the expedition team who also directs the Perot museum’s Center for the Exploration of the Human Journey. Peixotto, who will soon return to the site for more explorations, says although there is no standing water inside the cave, there is lots of humidity as well as occasional bats. ”Once in a while, we’d find these cool, cave adapted bugs,” she says further describing the creatures as translucent. Peixotto says it was exciting and rewarding to be part of the diverse team that came together from around the world to analyze the ancient bones. Visit perotmuseum.org for more information about the free VR app that is available at Google Play and the Apple App Store.